As you can image there is a great deal of interest in what we are doing. 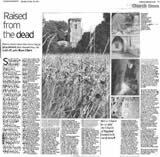 Shown below are some articles from the local and national press and some websites of interest. 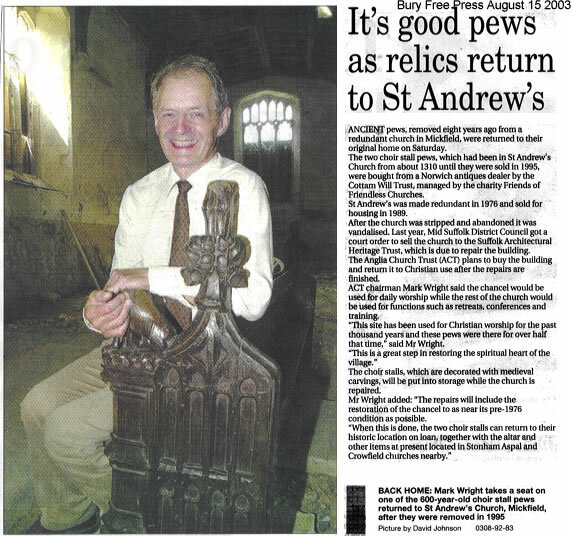 "Ancient Pews, removed eight years ago from a redundant church in Mickfield, were returned to their original home on Saturday. The two choir stall pews, which had been in St Andrew's Church from about 1310 until they were sold in 1995, were bought from a Norwich antiques dealer..."
Click for larger image "Surveying the few houses that make up Mickfield, set deep in the turnip fields of Suffolk, it is hard to imagine how St Andrew's church ever managed to raise a congregation. Yet the undergrowth heaves with the gravestones of the God-fearing squires and peasants who, every Sunday for six centuries, came to worship here..."
Links to websites with a link to St Andrews, Mickfield. ACT cannot be held responsible and makes no claims for the content of external websites. Keltec Trust Helping churches acquire surplus and/or redundant bells to be hung for English-style full-circle bell-ringing.